I am painfully oblivious to sports. There was a period when I was not, back when I was a youngling. While living in England, I was an earnest supporter of Aston Villa, for the sole reason that my youth league team wore their colors and coopted their name. During my teen years, I was briefly into the Redskins, until I realized that I did not enjoy the psychological anguish that inflicted nearly every Sunday. Life serves up enough pain as it is without being a 'Skins fan. And so, gradually, I drifted into this place where sports are just part of the background noise of culture, part of the chatter, as immaterial to me as fashion trends or the behavior of B-list celebrities. Still, it serves up some interesting stuff now and again, and the phenomenon of Tim Tebow has enough resonance with my actual interests that I can't help notice it. Tebow is the goalie for the Denver Nuggets, and...wait...hold on. Let me wiki that for a second. Oops. Start again. 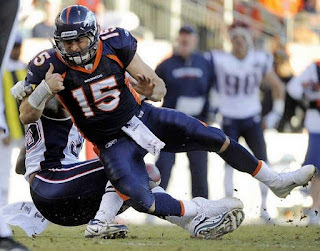 Tebow is the quarterback for the Denver Broncos. He is, best I can tell, an average-ish QB by the standards of the National Football League. Winning the Heisman Trophy is not the mark of an average college ball player, and he did indeed win it while playing for the Florida Gators. Pro ball does have a tendency to chew up and spit out Heisman winners, in my recollection, but Tebow has hung in there. His physical gifts are enough to make him competitive, and while he's far from the best in the league, he's a young professional player with acceptable talents. That, of course, is not what has made Tebow such an iconic figure. He's a conservative evangelical Christian, home-schooled by missionary parents. As such, he views the world through the lenses of that faith community. He prays a great deal. He is earnest, and wears his faith on his sleeve. Interviews almost invariably begin with him thanking his Lord and Savior Jesus Christ, and then thanking his team. He makes a habit of kneeling to give thanks to his aforementioned Lord and Savior frequently, so frequently the action has become known as "Tebowing," and is effusively thankful to Jesus after a win. This bugs people. As a progressive Christian, I understand this. Despite what is mistakenly taught to many young evangelicals, folks who are all up in yo bidness with their faith can be annoying. Last week, as the New England Patriots were in the process of delivering a monstrous shellacking to the Broncos, I logged in to Twitter for a while, searching for hashtag #Tebow. The game? Meh. Not my thing. I was more interested in observing the overflowing cup of 140-character hateration on Twitter. It did not disappoint. Almost without exception, tweeps were gleefully rejoicing in Tebow's comeuppance. Quip after quip poured from the Twitterverse, mocking him for his expressions of faith. While I'm cut from very different theological cloth than Tebow, I confess to have found it really rather unpleasant. Sure, God doesn't care who wins football games. It's just a game, dagflabbit. God is no more vested in the outcome of an NFL game than God is vested in a multiplayer round of Call of Duty, or in a really bare-knuckle game of Canasta. In the broad scheme of things, it doesn't matter in the slightest. This is why folks like Jimmy Fallon are so eager to creatively poke fun at Tebow. How stupid of him to pray about it! What a dumb-dumb-head he is! Or words to that effect. But as easy as it would be to go that route, I can't. Why? First, Tebow shows no signs of being a smug, self-righteous human being. Yeah, he's got a bit of Jesus-Turettes in his speech patterns, but what sort of person does that make him? By all accounts, his team members really like him. In the locker room, he's patient and supportive and kind. In interviews, he comes across as gentle-hearted and soft-spoken. He is, best I can tell, a bit like a larger, beefier Ned Flanders. I've known folks...conservative, Bible-believing...who were unbelievably giving, kind, and gracious because of their simple faith. Mocking such a soul serves no purpose. Second, Tebow is a football player. That is what he does. Football is a game, true. But how much less meaningful is it, honestly, than any other human activity? If I manage a small IT consulting business, is that really more meaningful? From his faith, he chooses to pray and be grounded in his Maker on a regular basis as he goes about what he does. That seems well within the bounds of the acceptable. The question is: what sort of football player does it make him? The answer seems to be similar to the above: a well-liked, supportive, good-hearted one. If he wins, he's thankful and humble about it. If he loses? He's gracious. That, boys and girls, is the point and purpose of prayer. It is not magic that bends the universe to your will. It is, instead, the magic that allows you to maintain your integrity as a soul in the face of whatever comes your way. I just can't see the problem. With the season close to done, and the one football game I watch annually coming up, I do find myself wondering if the hum and crackle around Tebow will continue next season.